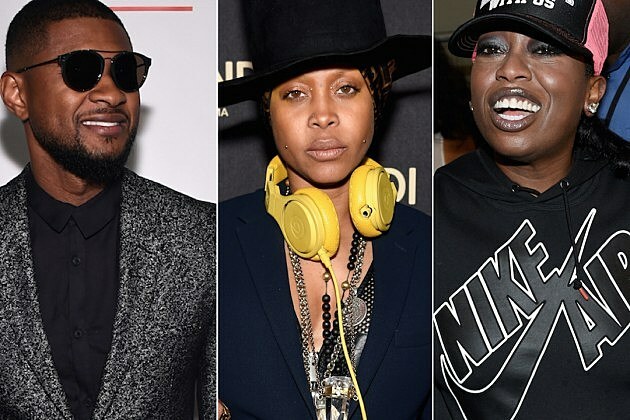 From Erykah Badu calling her ex-boyfriend out onstage to Missy Elliott’s set being cut short unceremoniously, there were a number of highlights at the festival. Take a look at our list of Ten Moments of Day Three at Essence Music Festival. On the walk into the Superdome, a woman who looked to be in her mid-thirties commented: “I don’t even know why they have Usher here though. Is he working on a new album?” Her companion, another woman, a few years younger, replied, “I get it but Missy should be headlining. They could’ve had Usher earlier in the evening.” It wasn’t the first and it wouldn’t be the last time we heard that statement that night. Many attendees didn’t seem uber ecstatic to see Mr. Raymond but when his set was teased onstage last night, there was definitely a roar of anticipation. Still, during his set, there were plenty of walk outs from the Dome. Common opened the main stage on Saturday night and after just a couple of songs, including “The Corner” where he incorporated the instrumental of Jay Z’s “Where I’m From,” the Chicago rhymer invited a young woman up onstage and she couldn’t get up there fast enough. As soon as she hit the stage, he took her hand and sat her down on a stool. “What’s your name sweetheart?” he inquired. “Ashley…” she said, with a grin plastered across her face. “Ashley, where you from?” “Columbus, GA,” she answered. By the last line, “I’m telling you Ashley that you should come close…,” it seemed every woman in the crowd was hollering. Ashley kept it cool on stage but everyone else lost it on her behalf. Of course, Louisiana came out for Mystikal at the Coca-Cola Art of Hip-Hop stage. The Superlounge was 90 percent full and for the first time at this year’s Essence Fest, the workers at the Superdome were holding the line at the door. During Mystikal’s performance, the hometown hero brought someone out onstage. “I done got musty so I gotta go put on deodorant or something. I brought y’all a special guest though,” he told the crowd. R&B singer Cupid of 2007’s dance craze “The Cupid Shuffle” appeared and the audience was receptive. It seemed perfect to have the man who created the quintessential family BBQ dance here onstage with Mystikal on the 4th of July. So instead of being in someone’s backyard, clapping it up, we were all two-stepping in the Dome. They followed “Cupid Shuffle” with their collaborative effort 2014’s “The Wham Dance” and it was the first time we was surrounded by Louisiana accents and euphoric dancing all weekend. Everyone just seemed so happy. Downstairs at the main stage, Erykah Badu poked fun at her ex-boyrfriend Common who had performed at the start of the evening. Not even fifteen minutes into her set, the music starts for their 2002 collaboration “Love of My Life (An Ode to Hip-Hop).” “Somebody tell me if Common already did my s—,” she shouted. “He did my s—? Hold up. I’ma show y’all how I do it.” The Analog Girl went into the track and supplemented what Common did with a little more soul. “Maybe ’cause y’all don’t see people dancing no more,” Missy said, mid-set. “They just be in the club like…” She folded her arms, standing in the center of the main stage. The crowd cheered. That’s one thing for sure — Missy Elliott has always been good for a few super energetic tracks and keeping a crew of talented dancers. From the beginning of her set to the end, from “All in My Grill” to “Get Your Freak On,” the dancers shared the spotlight with Missy equally. At one point, she felt people weren’t getting it and had the sound operator rewind the track so the audience could grasp the complexity of the steps being performed onstage. The first time Missy Elliott asked the sound operator to rewind the track, there must have been some sort of glitch. Presumably something chipped out because there was no sound at all after that and she was beginning to look antsy onstage without a backup plan in place. “See?” she said, wearing a shaky smile. “Somebody getting fired tonight.” The crowd cheered her on, despite the technical issues. Once the music finally restarted, she fought to get the energy at the Dome back to where it had been before the hiccup. Missy jumped off stage to run around in the crowd on the floor and encouraging them to “turn up.” Unfortunately, later on, as she was bringing Jazmine Sullivan out for “Need U Bad,” the crew cut her sound and her mic, indefinitely and unceremoniously. Towards the end of Usher’s set, he appealed to the success of his most recent collaboration, Wale’s “The Matrimony” and wasted no time bringing the DMV rapper out to the main stage. Women screamed from everywhere in the Superdome as Wale made his way to center stage, dressed in all white.